When doing research for these blog postings, I use a number of sources at my disposal. There are wonderful online databases that the library subscribes to like Ancestry.com, Fold3 and Heritage Quest. Between them they give me access to U.S. census records, the Social Security Death Index and World War I and II draft registration records. I can also find myself mired in the Daily Herald that goes back to 1905 and is available on Newspaper Archive. In addition, the library has digital access to historical articles in the Chicago Tribune and the New York Times. We also have some other key newspapers that can be found on Access World News. It just takes a Schaumburg Township District Library card and your PIN number to get into all but one–Ancestry.com–of the databases from home. I also make use of a number of plat maps, topographical maps, and documents that are in our collection. Take a look at our Local History Digital Archive to see what we have online. All of the maps and documents that you see on the Digital Archive are also available in hard copy. There are some topographical maps that are only in hard copy. If you need any assistance with research on Schaumburg Township, I am happy to help. Also, if you have any phone books or yearbooks to add to our collection, please send me an email. 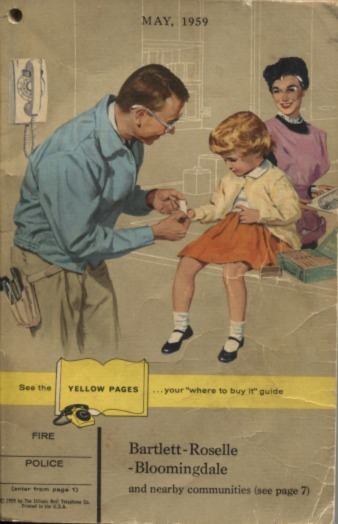 Phone books from 1960 to 1981 are desperately needed! 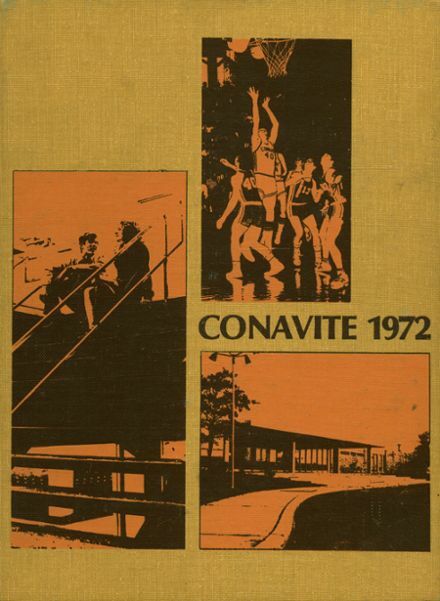 Additional copies of certain yearbooks would also be welcomed. This collection was largely begun around 2000 and continues to grow. If you are cleaning house and don’t know what to do with local photos or documents, consider the library. We may very well be interested and are just a phone call or email away! Our guest contributor this week is Pat Barch, the Hoffman Estates Historian. This column originally appeared in the June 2009 issue of the Hoffman Estates Citizen, the village’s newsletter. The column appears here, courtesy of the Village of Hoffman Estates. The early years for Hoffman Estates homeowners were filled with volunteer work at school, membership in the Women’s Club and work with the Hoffman Estates Homeowners Association. A lot more happened on back yard patios than just having something cool to drink and watching the kids. On a summer afternoon in 1958 Jean Davenport and Edna Shore were sitting in Edna’s back yard when Jean suggested that Hoffman Estates needed a library. Since Edna was the Culture Chairman for the Lakeview P.T.A. Jean suggested that she could get things started. The ladies talked with friends and neighbors and many agreed to help with establishing a Hoffinan Estates Library. Diane Woodhouse served as the first chairman of the library planning committee. Reverend Albert Harkins, Leonard Pecilunas, Bonnie Samuels and Bernice Suttle also served on that first committee. The women began going door to door asking for book and monetary donations for the new library. They set a goal of $550 as the amount needed to start the new library. Jean Davenport took over as committee chairman in January, 1959 and succeeded in raising $233 that month alone. The Hoffman Estates residents donated 4,000 books for the first library. There were many neighbors and friends who worked hard to raise the money and find a home for the new library. Jack Hoffman of F. & S, Construction offered the basement of the Hammerstein Farm Community Center for the library. The volunteer group named the library the Arthur Hammerstein Library of Hoffman Estates. The plan was to ask each family to pay $2 to use the library. More space was needed for the library materials and Mary Zimmerman, principal of Hoffman School, offered an empty classroom space for the growing library, but it was only a temporary home as the school enrollment was growing as well. When space and time ran out, Jack Hoffman came to the rescue and offered the library the use of an empty house on Roselle and Schaumburg Rd. It was obvious that a larger public library was needed. The Hoffman Estates committee and the library committee from Schaumburg felt that neither Hoffman Estates nor Schaumburg was large enough to support a public library. Together they decided that a township wide library would best serve the residents of the area. On September 8,1962 Schaumburg Township residents approved the referendum for the new Schaumburg Township Library by a vote of 430 to 69. That first volunteer committee was responsible for encouraging their neighbors and friends to support a library for Hoffrnan Estates families. Fifty years ago Jean, Edna and Hoffman Estates volunteers planted the seeds and they grew to become not only our library but a library for all the Schaumburg Township residents. DO YOU HAVE A TREASURE TO SHARE? 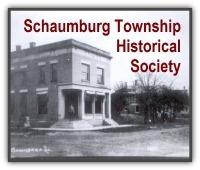 The History of Schaumburg Township blog recently had its fourth birthday. Over the past few years random presents from readers have come our way and made the blog more entertaining, interesting and informative. Take, for instance, one of the first presents that arrived. 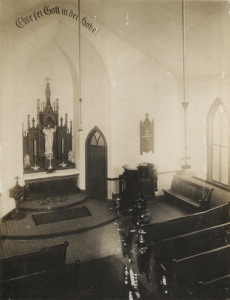 It was a wonderful, large interior photo of the St. John Lutheran Church that was built on Rodenburg Road in 1910 as a replacement for the original that burned down after it was struck by lightning during a thunderstorm. The photo was in perfect condition and was one I had never seen. 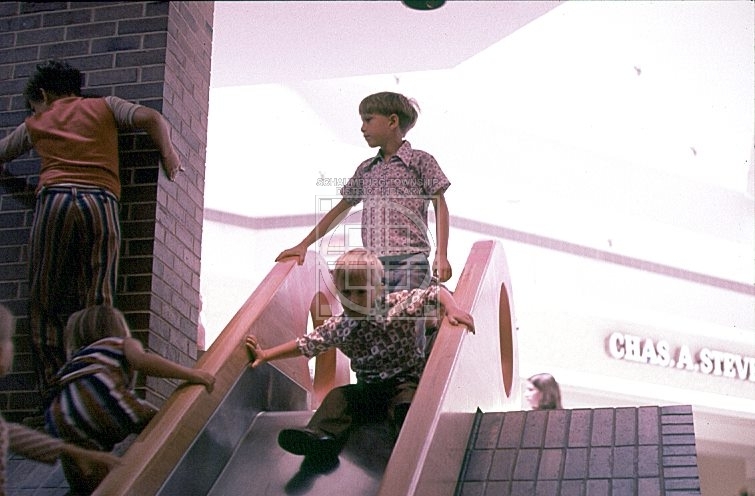 Or, how about the picture a reader shared of the slide at Woodfield Mall? With so many of our readers growing up during the early days of Woodfield, who wouldn’t get a kick out of that? And, then there was the Super 8 film of Schaumburg Township, circa 1975, that was a generous gift of Jay Campbell, another one of our readers. Not only did he contribute the video but he was also kind enough to gift the library with his collection of 1980s phone books for our area. What a wonderful prize! Are there other treasures out there? Yes. Definitely. All you have to do is take a moment to consider you and your family’s place in our history—and that nothing is too big or too small to consider. Maybe it’s a photo of Fairview School, or a local business like Hippo’s or the Marathon gas station at Schaumburg and Roselle, or an event such as the Septemberfest Parade or the opening of Woodfield. Maybe it’s a brochure from your subdivision or a cookbook put together by the ladies of a local church or maybe it’s a calender from a business that’s been closed for five years. It may seem like nothing much to you but it can be a whole new piece of the puzzle of our area’s history. So, keep the library in mind when you are moving or cleaning house or closing a business. Think of us when you open a box or photo album and discover a picture or paper you had forgotten. Don’t discard something you’re sure we won’t be interested in. Your tidbit could be our treasure. History is in the eye of the beholder and it’s always intriguing to behold a piece you had forgotten or hadn’t seen in a long, long time. That is the intent of this blog and that’s what a gift, a scan or a copy can mean to a local history collection. 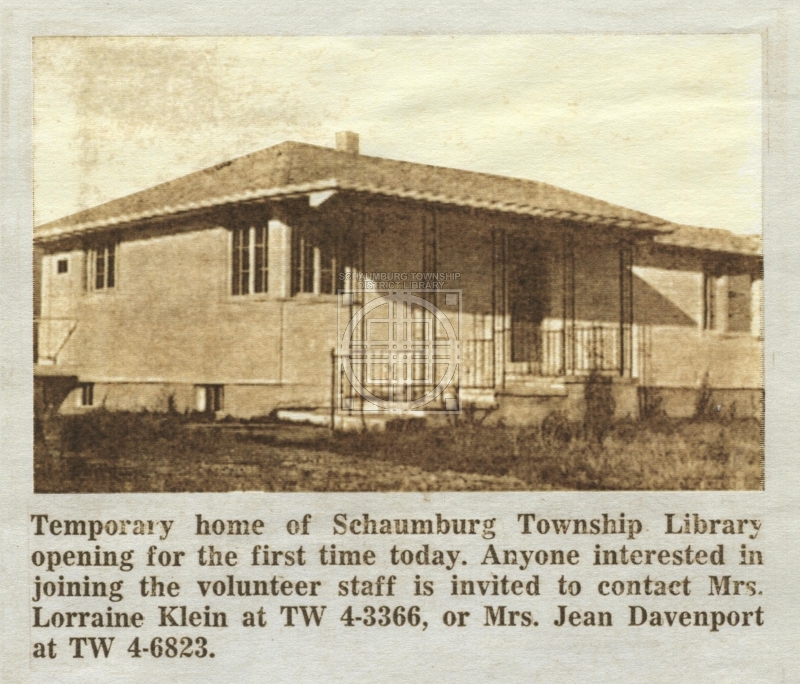 The Schaumburg Township District Library is here to add to the history of Schaumburg Township and with your help we can do it piece by piece, paper by paper, photo by photo. Let’s see what surprises 2014 can bring! WHERE EXACTLY WAS THE HOME OF THE FIRST LIBRARY? The voters of Schaumburg Township participated in a special election on September 8, 1962 that would determine whether a public library should be established and maintained. They also voted for six potential library trustees. The measure passed and the library opened for business on January 3, 1963 as the Schaumburg Township Public Library. The location? A small, white frame ranch house just north of Schaumburg Road on Roselle Road. 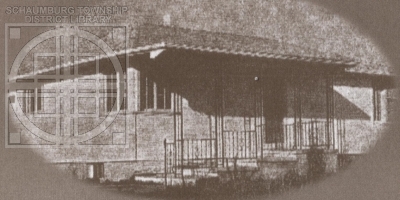 For years we’ve known what the house looked like on the outside thanks to this somewhat grainy photo with unknown origins. Then, one day, in walks local resident Bud Napier with a handful of pictures. 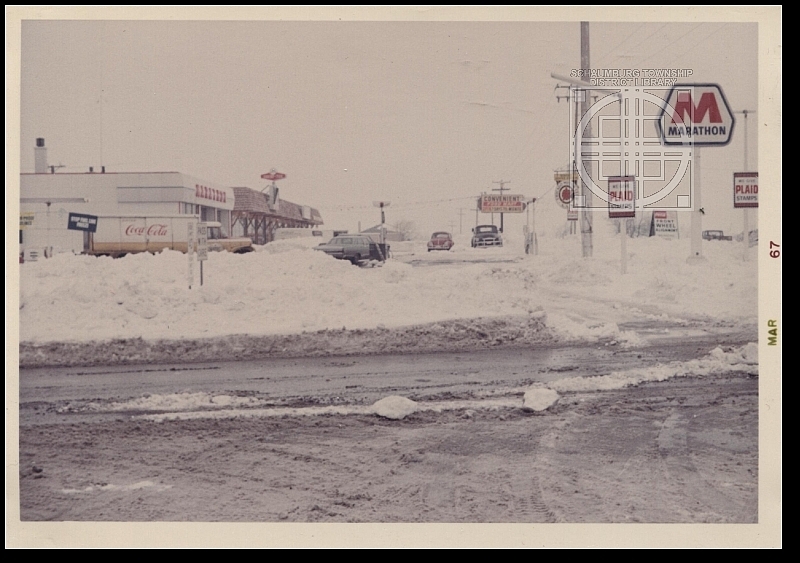 In the midst of showing me an interesting photo of the intersection, buried in the blizzard of 1967, I started looking at the background of the photo. And there it was. I looked past the Marathon Station and then past the strip mall that had just been built (and was very recently torn down) and noticed a small ranch house that looked very familiar. It was the library. You can see it here in the shadows. Not exactly next door to the Marathon Station is it? By this time the library had moved into its newly built, permanent home on Library Lane. But the ranch remained. Now, if we could just figure out how the ranch got there in the first place. Mr. Napier says that the house was moved down Roselle Road from Nerge Road by Paul Rosenwinkel, a local farmer. One of our longtime staff members says she remembers that the house once sat on the Golden Acres Country Club aka the Schaumburg Golf Club. According to her the house served as the caretaker’s home and sat behind one of the homes on Batavia Lane in Parcel B of Hoffman Estates. Maybe one of these days, we’ll solve that mystery too. HAPPY BIRTHDAY SCHAUMBURG TOWNSHIP DISTRICT LIBRARY! Our guest contributor this week is Pat Barch, the Hoffman Estates Historian. This column originally appeared in the February 2012 issue of the Hoffman Estates Citizen, the village’s newsletter. The column appears here, courtesy of the Village of Hoffman Estates. 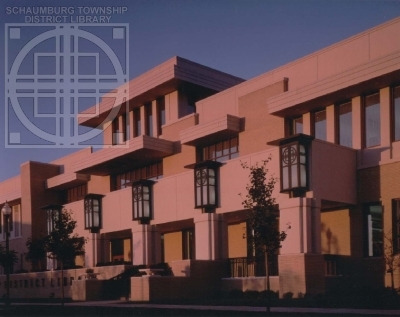 During 2012, the Schaumburg Township District Library will be celebrating its 50th anniversary. During the past 50 years, the library has moved from a small house on Roselle Rd (opening on Jan. 3, 1963) to the library building at 32 W. Library Lane that was constructed in 1965 and opened on January 9, 1966. Now the library is housed in a 166,501 square foot building at 130 S. Roselle Rd., with branches in Hoffman Estates and Hanover Park. It’s the second largest library in Illinois. In 1958 a library had been started by the women of Hoffman Estates. Edna Shore, who was Culture Chair for the Lakeview P.T.A. was encouraged to start a planning committee to establish a Hoffman Estates Library. Diane Woodhouse served as the first chairman along with committee members Rev. Albert Harkins, Leonard Pecilunas, Bonnie Samuels and Bernice Suttle. The Hoffman Estates Women’s Club, and other women in the community, went door to door collecting books and money for the proposed library. They set a goal of $550 for the new library. Residents donated 4,000 books and space in the basement of the Hammerstein Farm Community Center was donated by Jack Hoffman. The library was named the Arthur Hammerstein Library. D.E. Allison & Assoc., Architects & Engineers in Roselle, drew up plans for the new library but fire struck the building and the library had to find a new home. Mary Zimmerman, principal of Hoffman School, offered a classroom as a temporary home. It opened on April 6, 1961. Book stacks were donated by Pure Oil Co., John Steffen donated time to remodel the library area and F.& S. Construction contributed $500 toward the project. 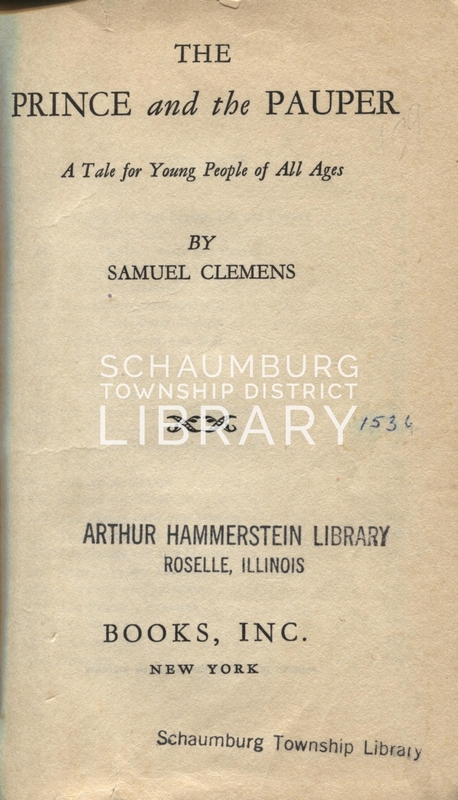 In 1959 the Village of Schaumburg started a library committee. Mrs. Frank Wiley and Mrs. Fred Groen were members. They, along with the Hoffman Estates library committee, brought the Fox River Valley Regional Library book mobile to the area. But the bookmobile would soon run out of funds and the Arthur Hammerstein Library would run out of space at the school. Both committees realized that neither Hoffman Estates nor Schaumburg was large enough to support a library. 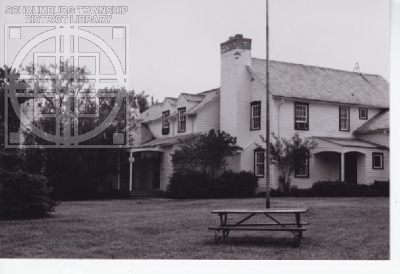 It was decided to establish a township library and the referendum was held on Sept. 8, 1962. It was successful with a vote of 430 for and 69 against. The Arthur Hammerstein Library committee donated its 4,000 books and all its equipment to the new Schaumburg Township Public Library. An additional 2,000 books would be loaned from the state library. A small house on the west side of Roselle Rd. just north of Schaumburg Rd was rented from Mr. Mraz and the new library opened on January 3, 1963. On that first day, 76 books were checked out and 19 applications for library cards were filled out. In 2011, during the busiest month of July, the library checked out an average of 7,716 books each day or 723 books per hour. 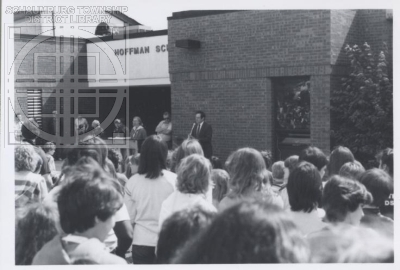 Looking back, we can thank the early residents of Hoffman Estates for their foresight and efforts to establish a library for their community. The Schaumburg Township District Library is more than anyone dreamed it would be back in 1958. It began in a small house, not unlike the ones our early residents purchased for their families. Today it is a 5 star premier library and the heart of our community. Congratulations to the Schaumburg Township District Library on its 50th Anniversary!